All Things Dog Blog All Things Dog Blog: Dogs Can Water Ski Too! Dogs Can Water Ski Too! Tanner is so on the waiting list for this activity! Our friend, John, is affiliated with a charitable group that provides opportunities to water ski with adapted equipment for disabled individuals. 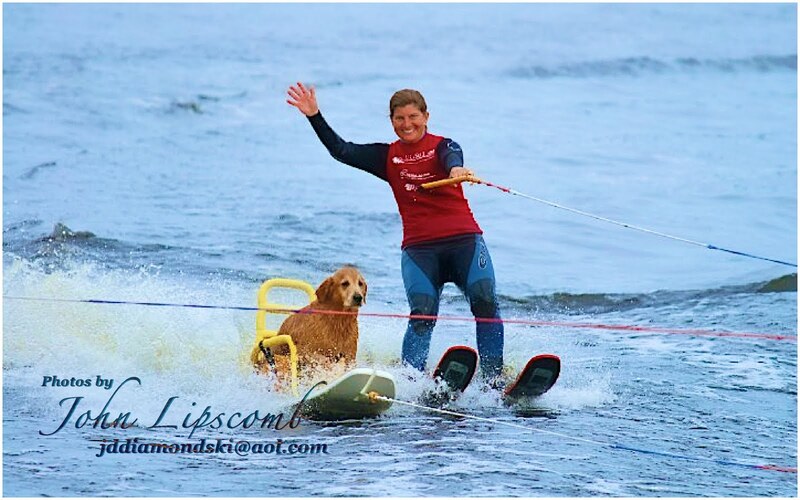 Malibu, the Labrador Retriever in this photo, is water skiing on a "sit ski" that makes it possible for a skier to use their body for balance, rather than their legs. As you can see, Malibu has learned to balance herself. Watch the video to see how her escorts assist her during the start up process, to see how Malibu gets up on her ski. Then, when she's done, they float her slowly to a stop, where she can hop out and swim to the dock. Her escorts remain by her side in case of any trouble, but as you can see, she's a trooper. Malibu has become the mascot for this disabled skiing group, sponsored by U Can Ski 2. After you watch her short video here, you can go to 5 Minutes for Fido to see more photos of Malibu learning to ski. Check out their website for more information on adaptive water skiing opportunities for many unique physical challenges--even being a dog! While you're on All Things Dog Blog's site, be sure to look around and enjoy the content that you've come to know and love. Thanks for visiting, and don't forget to take time to enjoy your dog this weekend. Happy tails! I love it. What a cool idea. Stopping by on the blog hop. Great video! What fun! Malibu is certainly a role-model for doggie water skiing!! Awesome! Kirby is learning to stand on a boogie board at the lake. Being pulled behing a boat? I don't think so! This video reminds me of the time we went boating and, thinking that he would enjoy the experience, took our dog along. First of all, he was afraid of the water which surprised us because he loves taking baths. Then he became violently seasick and vomited all over the place. That too surprised us because he does fine in car rides even when we travel on rugged, bumpy roads. I can only imagine how he would react to being strapped into a water ski and so we didn’t dare attempt it although I now wish we had. Sounds like you made the right decision. This dog, Malibu, has grown up in a boat. It makes all the difference in the world. Happy tails!